Of all the the autochothonous grapes out there, Lacrima certainly seems to be one that is more native than others. This grape has held much fascination for myself and for those in my tasting group. There was complete silence in the room when it was first tasted. I’m not kidding. This varietal had us firmly in its grasp and you could’ve heard a pin drop, that’s how intense the nosing and tasting was! Lacrima means tear in Italian, as this is the shape of the grape. Another notion is that the skin is very thin when ripe and breaks easily, causing the juice to slide down, looking like tears. It’s very aromatic, hence the reason why it’s easy to keep sticking your nose in the glass. What is also interesting to me, was in my Italian Wine Ambassador program, I was amazed at how many had NOT tasted a wine made with Lacrima. Besides myself, there was perhaps two other hands that went up in the room when asked who had ever tasted it. 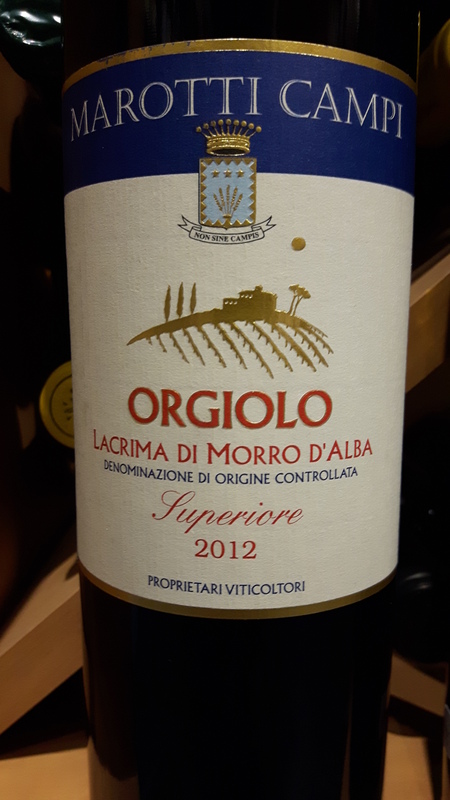 The DOC for this wine is Lacrima di Morro d’Alba. Not to be confused with Alba in Piedmont (where we know Barolo and Barbaresco to be), but this DOC is in Marche, on the Adriatic coast in Central Italy. Our group loves Marotti Campi Superiore Orgiolo, a quality made wine with raspberry notes and amazing intense aromas of rosewater and lavender along with spice notes of pink pepper, cinnamon and green cardamom. I’ve also tasted Lacrima made in a sparkling version which is nothing short of cool. Same intense floral notes, in an off sweet, creamy fizzy package! It can also be made in a passito style which I’ve never had the privilege of trying yet. This style is apparently a great match with chocolate desserts! I look forward to having that combination sometime in the near future! I am one of the few stores that carries this wine and this grape! Fitting into our thirty-something category at $34.95! Cin Cin! This entry was posted in Education, Joy of Wine, Varietals and tagged Adriatic, autochthonous, di Morro d'Alba, grape, Italy, Lacrima, Marche, native, Thursday. Bookmark the permalink. A new grape to try!